British freelance writer, author and speaker, Sylvia Vetta, is on her fourth career after teaching, running a business, and having a high-profile role in the antiques trade in England. In 1998 she began freelancing writing on art, antiques and history. She then took a diploma in creative writing, which led to the publication of her first novel Brushstrokes in Time. Sylvia's husband, Dr Atam Vetta, is Indian, so she knows that chance encounters can change lives, and she is interested in cultural exchange. 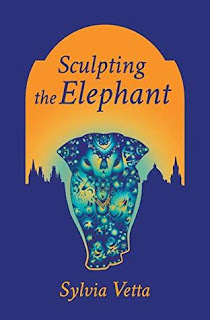 Her own experienced influenced Sculpting the Elephant, which concerns the relationship between British artist, Harry King, and Indian historian Ramma Gupta. When Harry trips over Ramma their lives change forever, but can their love stand the strain of crossing cultures? Their story becomes entwined with the life of a maverick Victorian who mysteriously disappeared in the Himalayas while in search of the emperor who gave the world Buddhism, but was then forgotten for the next 2000 years. I was moved by the reaction that my first novel, Brushstrokes in Time, evokes in young people from what some label "mixed parentage". It concerns Little Winter, a passionate artist in Beijing, in 1979. Little Winter has a daughter, Sara, whose father is Western. I was able to write about Little Winter and Sara with sensitivity because when my wonderful sons Justin, Adrian and Paul were growing up they were often defined by their Indian father’s genetic legacy. People don’t set out to marry someone from a different nationality, colour or religion. In my novel, Sculpting the Elephant, I wanted the story of Oxford-born Harry and Mumbai-born Ramma to be caused by a chance encounter much like my own first meeting with my future husband. And I wanted, too, that the results of their cross-cultural, cross-class, cross-race relationship should upset more people than they had thought possible. I took a copy of Sculpting the Elephant to my friend Caroline Henney, who inspired a character in the book. Caroline sells antiques in an Oxford antiques centre, Antiques on High. Here, another trader, Amanda Fore, flipped through it and read the dedication to anyone with a partner from a different country, religion, colour. Amanda reacted emotionally and said: "Glenn, my late husband, was African-American." And the stories poured out of her, of prejudice she suffered from both white and black people. Not that she was being critical. She actually just wanted to remember her delightful husband. A customer overheard and joined us. She said: "My husband is from Brazil and he has American-Indian ancestors." It was as if my novel had given a safe space to talk about these experiences of rupturing the norm. As these stories emerged, I realised that mixed-race marriages, or marriages that encountered barriers based on culture or class or belief, were far more common than I had realised. There was a lack of awareness of this reality when I was young, and the continuing lack of it now makes it seem more unusual than it actually is - at least in the UK. Perhaps it's different elsewhere, but wherever there are mixed-race couples struggling against the norms of their societies, if only those who raised their eyebrows knew how common mixed-race relationships were, then surely they would be more accepting, and more readily embrace difference? So, I decided to do something about it. I have since created a platform to share these stories and a hashtag #wetwo . In these divisive times I hoped that a We Two blog inspired by Harry and Ramma confronting barriers of nationality, colour, and class could provide a positive platform for sharing stories in whichever way couples wanted. Now I am actively involved in building a platform for people to share their own true experiences of breaking barriers for love. It is my hope that as more people tell of their struggles and their triumphs - tell of loving, getting married and raising children - we will stop seeing the category of mixed marriages and just see a couple in love. Details: Sculpting the Elephant is published in paperback and eBook by Claret Press, priced in local currencies.